Speed Zone Fun Park Pigeon Forge TN offers guests 4 exciting course that will challenge and entertain those looking for a little bit of an adrenaline rush in the Smokies. Standing apart from other go-kart tracks in Pigeon Forge, Speed Zone Pigeon Forge offers the only oval slick track in Smokies, 2 winding elevated courses, and a kiddie track for the Jr.'s of your family. Everyone has a little bit of NASCAR racer in them - why not let you, your family, and your friends enjoy your very own day at the races? With 4 challenging and exhilarating tracks, Speed Zone Pigeon Forge gives visitors to the Smokies and opportunity a chance to live out their fantasies as a daring, professional NASCAR driver. While you might not be riding alongside Earnhardt, Jr., Gordon, or Busch, there is plenty of fierce competition to be found at these Pigeon Forge go-kart tracks. Chose your racing experience on one of 4 go-kart tracks guaranteed to get your adrenaline pumping. Track 1- Speed Zone Pigeon Forge offers this winding wooden go kart track for the speed demon in the group. Enjoy spiraling up this tracks curves, climbing higher and higher up the track. Finally, swoosh, you're sent speeding down a dive. You'll definitely need to use your brakes on this as this track is built for speed. Track 2- A little less NASCAR and a little more Mario Kart, this concrete track will test your handling skills as you navigate the various curves, climbs, and dips. Try out this course at Speed Zone Fun Park Pigeon Forge, TN that will see who in your group has the best handle of a speeding go-kart on a course that requires skill and speed to win. Track 3- The only true oval slick track of the variety of Pigeon Forge go-kart tracks - this track at Speed Zone Pigeon Forge will really make you feel like a pro at Daytona. As you speed around the curves, letting your car drift through them with ease, let your inner speed demon run wild as this track is all about being faster than your opponent. Kiddie Track- Perfect for those "up and coming" racers this track allows the little ones in your group enjoy the thrill of racing like their favorite race car drivers on TV. Parents won't have to worry as Speed Zone Fun Park Pigeon Forge, TN always places safety first on this extra special track. In fact, the karts on this track contain the technology to shut off if a car goes sideways or blocks the track in another way until an attendant can make sure all is safe to continue the racing fun. The special Park Hopper Pass provides families looking to save with a special opportunity to save vacation dollars and still enjoy attractions like Speed Zone Fun Park Pigeon Forge TN! 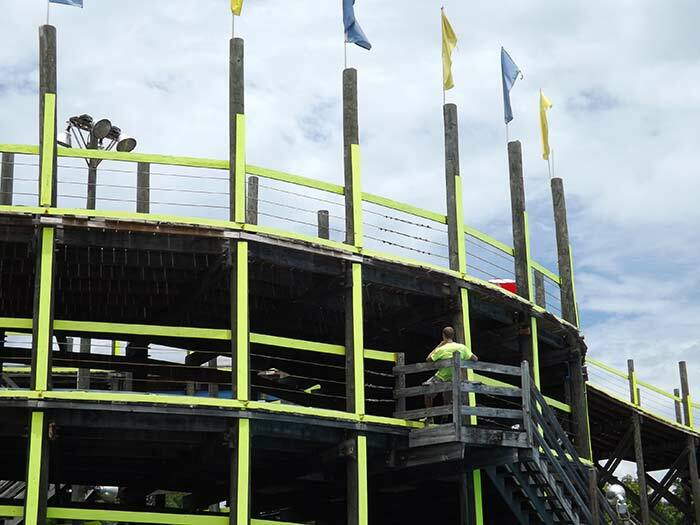 For a discounted price, enjoy up to 5 activities at Speed Zone, LazorPort Fun Center, and Xtreme Racing! Keep your armband and receive additional discounts at Five Oaks Riding Stables, Adventure Park Zip Lines, and Tree Tops Ropes Course as well! Stay Close to Speed Zone Fun Park Pigeon Forge TN! Cabins USA's cabins in Pigeon Forge offer guests an opportunity to stay close to all the action and attractions such as Pigeon Forge go-kart tracks like Speed Zone Pigeon Forge. Enjoy convenience and comfortable lodgings in a serene wooded setting for a mountain vacation to remember in the Great Smoky Mountains!